After working hard to create a proxy for blocked photo on Flickr and Picasa, I finally get back to the original question: nothing can be more inefficient than solving a problem that does not need to be solved. If anyone cannot see my photos, it is because we are all living inside the high great wall. Learning how to get access yourself… I just find out to use code to solve problem is always more time-consuming than expected. 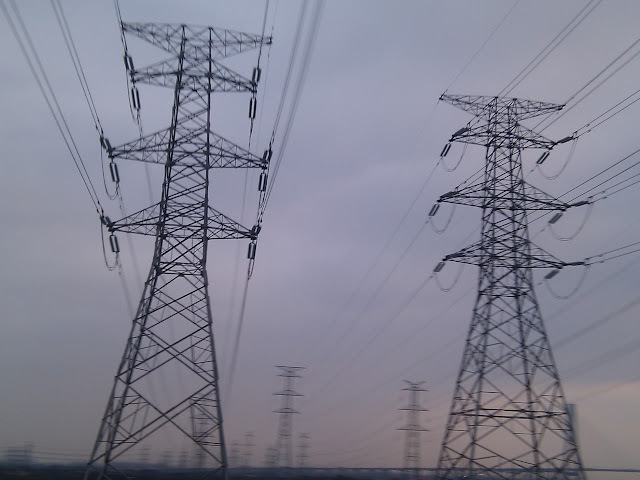 The official name for “ELECTRONIC POWER TOWERS” is “Electricity Pylon” or “Transmission Tower”. I live in Thailand. Your picture display in the post with no problem at all. It is an interesting picture as I also have interest in these towers, on my trip I noticed that China has lots of towers along the highway, different type and shapes. The appearance of your photo makes me wonder if it was taken by mobile phone or not, would you mind to tell?